Every goddamn day: 04/21/19: How do you do it? Jim Kokoris is not a literary genius. His writing does not crackle. His characters are not clockworks of complexity; his plots do not pinball from Venice to Venezuela. They tend to stick around suburban Chicago, although his new novel manages a drive east across the country. In short, Kokoris writes as if he were a career public relations man who lives in LaGrange, which he is. One who, through hard work, talent and luck managed to do what many PR guys dream of and never do: carve out a career as a novelist. His four novels are stacked on my desk. Grab one — "Sister North" — and flip it open to a random page. 114. "We still have customers," Leo said. Meg glanced up at Sam. "I'm leaving," he said. He finished his beer in two swallows, as if he had somewhere to rush off to, as if he had some home to protect, kids to pick up. Simple, direct, with a family lurking problematically nearby. That's Kokoris' oeuvre. Reading him, I can't decide if his writing is simple as in Hemingway or simple as in "Open can. Heat soup." But I lean toward the former. Even those few, random sentences draw you in, don't they? Where's Sam going in such a hurry? His latest novel, "It's. Nice. 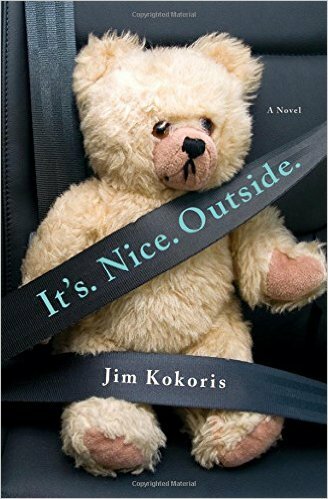 Outside.," published next week by St. Martin's Press, revolves around John Nichols, a 50-something novelist with a severely autistic 19-year-old son, Ethan. Kokoris crafting this story was not a bravura feat of imagination on par with, say, Frank Herbert conjuring up "Dune:" Kokoris is also a 50-something novelist who has a severely autistic 19-year-old son, Andrew. "He is the Ethan character," Kokoris said. "Everything else is pretty made up, I'd say half of John Nichols is me, in terms of personality." In the book, Nichols has his older daughter's wedding to attend, and decides to drive with Ethan, despite his need for continual potty breaks and tendency to dissolve into embarrassing public meltdowns. His hidden goal is to take Ethan to a group home in Maine afterward, and either introduce him to an exciting new phase in his life or dump him with strangers. "It's. Nice. Outside." is a book that you can't stop reading, even though at times you might want to. If you've ever spied a harried father shepherding an adult child with exceptional needs, or whatever the current euphemism, and wondered what that man's life might be like, this book will tell you. Though Kokoris suggests this is the sanitized version. "I didn't want to make such a downer book," he said. "At the end of the day, I'm a humorist, and needed to make people laugh. I wanted this not to be a depressing book." The book isn't depressing. It's riveting, a journey with a family broken in several places — the constant demands of Ethan, absorbing the attention his sisters could have used. Nichols' failed marriage. The wedding itself which — well, better not give too much away. The book seesaws on an issue all too real for parents like Kokoris. "It's not necessarily a book with a cause, but I do worry what's going to happen when we're not around anymore," he said. "Where are these people going to go when they age out of the system and when their parents die? That's my biggest fear now." "I ask myself that every day," he said. "It definitely gets easier. You just accept. The terrible first year. [You say] 'This can't be happening to me.'" "You know how to navigate the minefield, 'We can't really do this, but we can do that.' You just minimize the bad times. It does get easier. "Many times, it's pleasant too, good days and bad days. Good days you enjoy and bad days you try to get through. Let's put it this way: You will go home to a very different house than I will." I wrote a column on Kokoris in 2001, after his first book. How is the transition from first-time novelist to seasoned pro? "I was pinching myself back then, it was like a dream," he said. "I had the movie deal"— two of his novels have been optioned by Hollywood, but neither has been produced. "That was a lot of excitement. But after 14 years you kind of know the drill, I temper my hopes now. I'm very, very lucky just to be published. Still, you always hope for the best, to find your happiness." Jim Kokoris will read from and sign "It's. Nice. Outside." Dec. 4 at Anderson's Bookshop in LaGrange and Dec. 8 at the Book Stall in Winnetka. Well, that's a relief. I was feeling a bit let down by your opening, but now that's replaced by anticipation. Onto the library list it goes. I think I would be more likely to grab this book if he told the story from the viewpoint of his son. Despite knowing better I find it hard to see someone acting weird and not attribute it to willfullness on the part of the actor. It would be interesting to see the world through the autistic's eyes so as to understand the reasons behind his actions. John, you might find The Reason I Jump interesting. It was written by a 13-year-old autistic boy in Japan. I second "The Reason I Jump". My teenaged son has multiple special needs, and "The Reason I Jump" was such a gift to possibly understanding his worldview. I've hated reading fictional depictions of folks with special needs because so often the author either doesn't get it or wants to make the character into a symbol of something. I'd bet Mr. Kokonis gets it right. Thanks for the interview/semi-review. Oh, and another answer to "How do you do it?" is "You grow into it." Things manifest over time, and so there's plenty of time to learn and adjust. I screw up often enough, but then many of us do that with our normally-abled kids, too. Forgive ourselves, try again, try to learn from our mistakes. Agreed, and all the while hanging on tight in the roller coaster.